Organizations representing people of Middle Eastern and North African descent are asking the Census Bureau to add a new ethnic category on forms. People of this heritage are now categorized as “white,” a decades-old practice advocacy groups say is inaccurate. The new category would be broader than the Arab ancestry data collected by the Census Bureau since 1980. 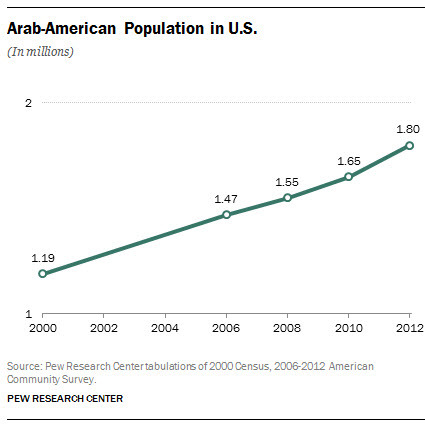 The Arab-American population is small but growing, and its exact size is disputed. The Census Bureau estimates there are 1.8 million Arab-Americans in the U.S., up 51% since 2000. But the Arab American Institute Foundation estimates there are nearly 3.7 million Arab Americans living in the country. The Arab-American population is also diverse, with people claiming ties to 22 countries and various religious backgrounds. A coalition of groups and individuals—including the Arab American Institute Foundation—sent a letter to the Census Bureau last summer that asked for a separate “Middle East/North Africa” ethnic category. A question about Hispanic origin, currently the only ethnic category, has been asked of all households since 1980. The census form instructs respondents that Hispanic is not a race. The Census Bureau is already looking at big changes to its form. One proposal would create a combined race and ethnicity question in which people would be offered all the race and Hispanic options in one place. Census data are vital to determining everything from how congressional districts are drawn to $400 billion in federal aid programs and enforcement of civil rights laws. Census officials say they are interested in further researching the Middle East/North Africa designation (also called MENA), and community leaders are optimistic the bureau will test a new ethnic category before the 2020 population count. Samhan said a meeting last week between Census Bureau Director John H. Thompson and groups asking for the new category included discussions about how to proceed with research. In a combined race and ethnicity question tested during the 2010 Census Alternative Questionnaire Experiment, the white race category included several examples—among them “Egyptian” and “Lebanese”—to guide those who might check the box. But when census officials convened focus groups to study the proposed changes, people said the Egyptian and Lebanese examples were “wrong” and “inaccurate,” said Nicholas Jones, a Census official who recently visited the Pew Research Center to talk about the bureau’s research. The push to be counted as something other than white is a reversal from a century ago. In the early 20th century, people from the Middle East argued in court to be counted as white instead of Asian. A major concern was anti-Asian legislation that sought to restrict immigration and deny Asians U.S. citizenship. A prominent example of this was the Chinese Exclusion Act of 1882. Because of distrust of the government, some in Middle Eastern and North African communities need to be convinced that a more accurate population count is in their interest, said Samhan of the Arab American Institute Foundation. The Census Bureau came under criticism in 2004 when it was revealed the agency shared data that listed where Arab Americans lived by city and ZIP code with the Department of Homeland Security. The data, though publicly available online, were handed over to DHS less than three years after the Sept. 11 terrorist attacks. It’s too soon to say whether a Middle East/North Africa category will appear on the 2020 census. Census officials say any changes would have to be approved by the Office of Management and Budget, which determines and defines the race and ethnicity categories. Any proposed topics must be submitted to Congress by 2017. Question wording is due to Congress the following year.